The remark, which drew loud applause and a standing ovation from many in the audience, set the tone for a day of examining anti-Jewish and anti-Israel sentiments and actions on the Left and Right at “Never is Now,” the ADL’s all-day summit meeting on anti-Semitism, held Nov. 17 at the Grand Hyatt New York. Without mentioning names, speakers took aim at potential trouble spots in the administration Trump is assembling, based on his appointment of Stephen Bannon as his chief White House strategist and his anti-Muslim and anti-immigrant rhetoric during the campaign. Bannon has denied he is an anti-Semite and has declared himself to be strongly pro-Israel, a claim that was backed up by the Zionist Organization of America. In response, the New Israel Fund, an organization that promotes democracy and equality for all Israelis, released a petition signed by 3,000 American Jews calling on Jewish organizations to cease “rallying around someone who has built the media infrastructure that routinely pushes racist, bigoted, and xenophobic opinion,” according to an NIF press release. 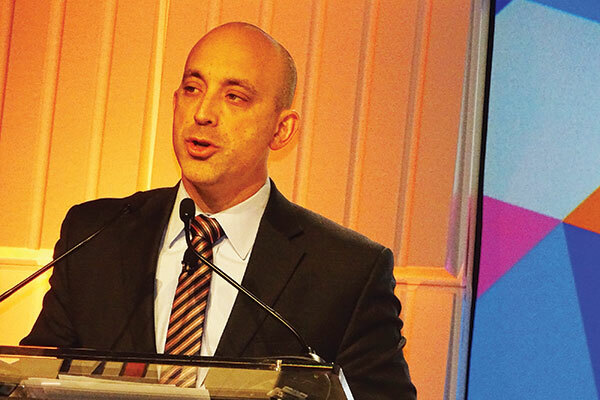 During his keynote address, Greenblatt said that although the American-Jewish community has achieved an unprecedented level of success, many fear that the situation might be about to change. “There are troubling signs,” he said. “We need to wrap our heads around the threats from the radical Left that seeks to delegitimize Jewish peoplehood and from the radical Right that embraces white nationalism and other racist ideas. “We need to speak loudly when we see anti-Semitism and bigotry, no matter the source…and we must stand with our fellow Americans who may be singled out no matter how they look, where they’re from, who they love, or how they pray,” said Greenblatt. This message resonated with two active members of the ADL’s regional New Jersey board who sat in the audience. 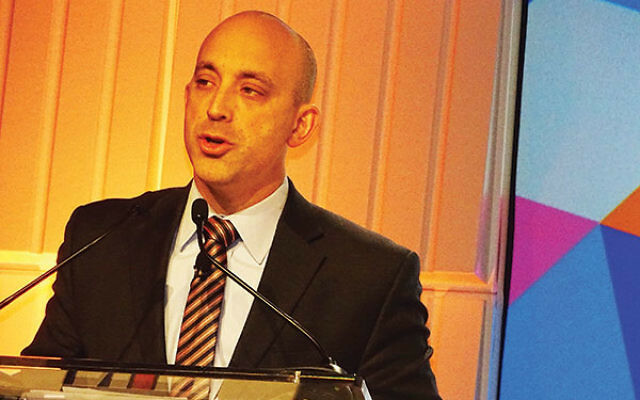 Responding to Greenblatt’s show of support for the Muslim community, Joshua Cohen, the ADL director in New Jersey, demonstrated that he is on the same page. “If there is a Muslim registry in this country, which is a shocking thought, I’ll be on line to register, too,” he said. During a break between sessions, Cohen told NJJN “we’ve seen terrible incidents across the country since the election utilizing swastikas and anti-Jewish and racist messages,” including the words “No Jews” spray-painted on a wall in New Jersey. Presumably Cohen was referring to graffiti in front of homes in Pomona last week. While discussing the controversial Black Lives Matter movement, Walker listed the atrocities of slavery, segregation, and the use of African-American men as uninformed victims of syphilis experiments. “They speak to the reality that black lives have mattered less,” he said. Community divisions arose again in an afternoon panel on the anti-Israel Boycott, Sanctions, and Divestment movement on American college campuses. Joining Felix Matos Rodriguez, the president of Queens College, and Rabbi Serena Eisenberg, the executive director of Hillel at Stanford University, were two undergraduate opponents of the BDS movement. Anthony Berteaux, a gay Asian American at San Diego State University, told the audience he was turned off by the anti-Jewish rhetoric expressed by some pro-Palestinian students in progressive political groups on campus, though the groups supported gender identity and racial justice causes. He said that his Jewish roommate, who was active in pro-Israel advocacy, influenced him to visit the country and learn about Zionism and Jewish history. As a result, “I got very active in pro-Israel activities in campus,” Berteaux said. He has often seen “issues of anti-Semitism and Jewish identity are not only just left out, but sometimes they are manifest.” He said he has spotted a “troubling trend” that views Jews as a powerful group that has fully assimilated into the white mainstream culture. “They entirely dismiss the history of Jewish oppression,” he said. Eisenberg said labeling her campus as a “hot spot” might mean Jewish students would be discouraged from applying to Stanford, a dangerous prospect in that it comes at a time when such students are needed to battle the hostile forces on campus. Forty seniors from Golda Och Academy, the Conservative Jewish day school in West Orange, were in the audience. After the panel discussion, several of the students told NJJN they were prepared for the possible battles over Israel they might encounter during their college years.